Corporate Transportation Solutions (CTS) would like to welcome you and your clients to the Sacramento Region and offer our services as needed. CTS is a professional chauffeured ground transportation provider specializing in business travel. The regions largest corporate provider with new satellite offices serving Stockton/ Modesto, and Lake Tahoe California. Recognized as a Finalist for National Operator of the Year 2007, 2008 and again nominated for 2009 as a National Finalist! One of only 3 companies nationally in our fleet size out of more than 9500 candidates. At CTS, we understand the need to partner with a professional chauffeured transportation provider that understands the demands of your business and the needs of your clients. At CTS we provide all new fleet vehicles which are impeccably maintained and detailed daily. We utilize Nextel phones and radios which incorporate GPS tracking of each vehicle. We understand the vehicle must be waiting for the client and not the inverse. Our vehicles arrive on site 10-15 minutes prior to the scheduled pick up time. Our chauffeurs are background checked, undergo random toxicology screening, and must have a clean driving record. Our chauffeurs are employees of CTS and must adhere to company practices and policies. Each team member must pass an annual review. CTS is properly licensed, insured, and a member of both the National Limousine Association and the Greater California Livery Association. We utilize “real time” flight tracking and the GT3/ Odyssey reservations platform. At CTS we utilize a fleet of luxury sedans and the areas largest fleet of luxury black Chevy Suburban SUV’s. Vehicles are equipped with tinted privacy glass and leather seating surfaces. We can offer limousines, vans, or luxury motor coaches. We offer a complete fleet of company owned vehicles and professionally trained chauffeurs. Providing professional service for business, leisure, wine tasting, weddings, evenings out, and all of your airport transportation! CTS Capitol Region Office is just minutes from the Sacramento downtown, Sacramento International Airport (SMF), and Sacramento Executive Airport (SAC). 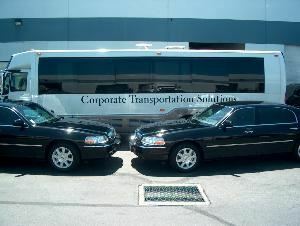 CTS is the area leader for corporate transportation. We are the first choice for many air charter companies visiting the region and the preferred provider to the local executive jet center. Licensed for all regional airports such as SMF, SAC, OAK, SFO, RNO. Recognized in the Capitol Region for our fleet facilities, vehicles, and professionally trained staff. Superior record for reliability and on time performance. Highest level state licensing available by the California Public Utilities Commission TCP#16022A. One of the few ground transportation companies in Northern California with a required Federal US DOT Number #1502226. Please allow us to show you the CTS difference. Feel free to visit our website at www.CTSLIMO.com or contact us directly at *NOT DISPLAYED* should you have any questions or wish to visit our facilities.